As I've gotten older I have definitely developed a love for perfume, it’s fast becoming my 'thing'. I especially love perfumes that aren't quite as popular as it’s always nice to smell a little different, however there are a few popular ones I just can't resist! My favourite thing about perfume is how transitional it can be and how different scents pair with different seasons and times, so nostalgic. 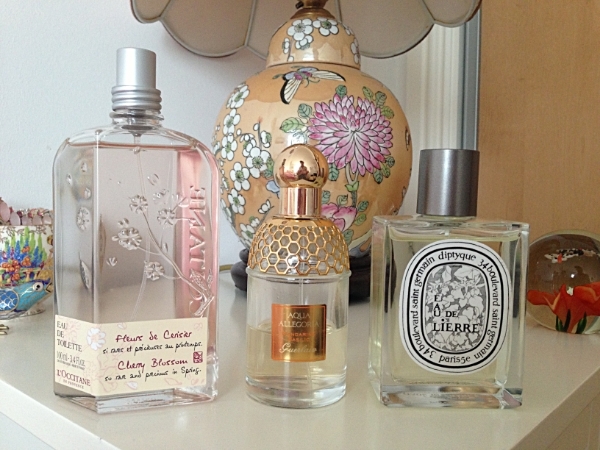 With this in mind I thought I'd share my top three scents for Spring. I've been spritzing these bad boys quite a lot recently in the hope that if I smell like Spring then maybe the weather will turn a little more ‘Spring like’. This plan is definitely not working, but at least I smell good! First up is a best seller from L'Occitane that is literally Spring in a bottle, of course I'm referring to the Cherry Blossom Eau de Toilette. Not only is the bottle beautiful the scent is too, this is a really soft sweet scent with freesia, blackcurrant and obviously cherry. It isn't your usual artificial sweet scent, this much softer and more grown up making it the perfect daytime Spring scent. It settles quite quickly and turns into a really fresh uplifting fragrance. As soon as I got a whiff of this I understood why it’s a best seller, I've yet to meet someone who doesn't love the smell of this. Next up is probably one of my all time favourite perfumes, Guerlain Aqua Allegoria in Mandarin Balsamic. I picked this up on a complete whim last year when I was on holiday and as soon as I smelt this I was converted, this is beautiful. The scent basically consists of mandarin and basil, which probably don’t sound too fabulous or exotic, but you need to smell this the next time your in a fragrance store. This for me is the perfect Spring/Summer evening scent as its quite rich and strong so a little spray will last you hours. I will say I don't think this would be for everyone as it is quite powerful, but I honestly don't think I will ever be without this perfume as it makes me so happy and uplifted every time I spray it. Last but not least is Diptyque Eau de Lierre this is an alternative scent to most Spring scents as it isn’t sweet at all, and there is no fruity or floral undertones, this is extremely woody and musky. What makes it perfect for Spring in my opinion is the lightness and freshness of the scent, it’s combination of pepper, ivy and musk create something very unusual and delicious. When first sprayed this literally smells to me like fresh cut grass, which although is lovely is not really what I look for in a perfume. However after a minute or two this settles and transforms into a beautiful musky aroma of fresh greens and subtle spice, which combine to make the perfect grown up, understated Spring scent. That’s my scent offerings for spring complete, hopefully there is something there for everyone, and hopefully our weather decides to tap into the spring mood soon too! What are your favourite scents for spring.